In Phnom Penh, life can either be laid-back or extravagant. You can rent a simple studio flat, pedal around the city on your bicycle and prepare steamed white rice for dinner. You also have the option, if your budget permits, to buy a condo loft, import your European car and dine in the string of restaurants all over Phnom Penh. Regardless of the lifestyle you choose, there are some daily essentials and tips you should know to settle in to your host country seamlessly. Getting your own car is not the very practical way of travelling around Phnom Penh. This is mainly due to the high import taxes on imported cars and the lucrative price of gas. The first thing you should know if you plan to drive around Phnom Penh is that your International Driver’s License is not recognised in the country. Many expats don’t bother to get a driving license and just opt to pay penalties. This is not advisable. Remember that health and travel insurance companies don’t pay road accident claims if the insured was driving without a license. B license for passenger vehicles that carries less than nine passengers. If you plan to drive SUVs and motorcycles, the B license will do. The standard processing time is 24 hours. A Cambodian driver’s license is typically valid for one year. Luckily, there is a wide range of public transportation options for you. Cambodia’s tuk tuk or the remork-moto is a carriage attached to motorcycle. It is found in the capital and the countryside. Tourists choose this mode of transportation for an open view of streets and majestic landscapes. You can also travel via the cyclo (pedicab) or the moto (motodups). These are usually found around markets, hotels and restaurants in Phnom Penh. Buses and taxis are also alternatives for commuters. Phnom Penh is the most liveable city in Cambodia. Aside from its business and entertainment districts, the capital is home to the safest and most secure residential areas for expats and their families. There are guarded communities, secure apartment buildings and reclusive villas favoured by foreign diplomats and well-off businessmen. Here are three of the best expat neighbourhoods for you. If you’re on the hunt for an expat neighbourhood, Boeung Kang Keng 1, or simply BKK1, is the place to be. The area has been the top destination for foreigners in Cambodia since the 1980s mainly because of the wide range of high-end accommodations, restaurants and bars and retail stores. BBK1 is also home to multinational companies and international organisations employing expats. The UN and foreign embassies are located in this district. It’s not a surprise that housing accommodations in here are a bit costlier than in other areas. A one-bedroom condominium unit for rent can fetch as high as US$2,500 per month. There are more affordable options such as two-bedroom furnished flats for US$480 to US$500 per month. Seek assistance from real estate brokers to get the best deals. For a picturesque view of Phnom Penh’s riverside, visit Sisowath Quay along the junction of the Mekong and Tonlé Sap River. Today, the historic riverside boulevard is a favourite hangout for tourists and expats. Find a string of quaint cafes, the majestic Royal Palace and the Foreign Correspondents Club of Cambodia. The quay is perfect for early morning strolls before starting a long day ahead. BBK1 is said to be the most charming district of Phnom Penh. As the saying goes, beauty is in the eye of the beholder. The riverside is a sight to behold in the evenings – beautiful lights reflect against the tranquil waters of the Mekong river. If you’ve been to Sisowath Quay, you’d understand why some foreigners decided to settle here. Aside from the restaurants, bars and boutiques, the National Museum is found in this area. A one-bedroom furnished condominium unit is available for leasing for US$750 to US$1,000. There are studio apartments you can rent for US$350 to US$500. Foreigners say that you haven’t experienced Phnom Penh if you haven’t visited the iconic Central Market. The now Art Deco Phsa Thmei (New Market) is a massive dome-shaped building where everything from traditional Krama scarves to silverworks is sold. Make sure you bring your negotiations skills in your shopping bag to get bargains on food, clothes and electronic items. The Central Market district is a centre of commerce. Everything you need is here. Rent is generally steep in this area. A two-bedroom apartment is for US$1,400 per month while a one-bedroom flat is available for US$550 to US$600 per month. You can say that the rents are reasonable since places here are within walking distance – saves a lot on transportation costs! Under Cambodian law, foreigners can own a real estate property in two ways: by purchasing a condominium unit with a strata title or by partnering with a Cambodian legal entity. This entity must have 51 per cent or more of its shares held by Cambodian citizens. 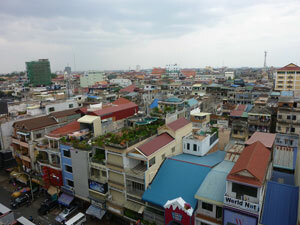 Nearly all types of housing accommodations are available in Phnom Penh. There are houses, apartments, townhouses and condominium units. A two-bedroom house with a terrace a garden can fetch around US$1m to US$1.2m. A one-bedroom condominium unit is priced between US$120,000 to US$180,000. Expat buyers need only to present their current passport and visa when buying a property. Renting is another housing option in Cambodia’s capital. Since Phnom Penh is a business and entertainment hub, you can expect slightly high rent rates in neighbourhoods. A two-bedroom apartment near the Russian Market is available for lease for US$500 to US$800 per month. A one-bedroom serviced apartment in BBK1 can be rented for US$1,200 per month. It’s advisable to seek the assistance of real estate brokers in searching for a suitable housing accommodation buy or lease. They’d be able to help in conducting a title search on properties and brief you on the processing, taxes and other pertinent information. The Cambodian education system has gone through a number of reforms since the 13th century. The ancient system involved teachings in basic literature, religion and manual skills such as carpentry and craftwork. During the French rule between the 1850s and the 1960s, the traditional system was supplemented by the Western model where maths and sciences were included in the curriculum. The latest reforms were introduced in 1996 where every student is required to complete 12 years of general education: six years of primary schooling (grade 1 to 6) and six years of secondary education (grade 7 to 12). A student can then pursue a university degree for four to five years. PPIU offers undergraduate, graduate and doctoral degrees. In 2009, it launched its International Language Center that provides General English courses, Business English and Teachers Training. Norton University offers bachelor’s degrees in arts, humanities and languages, sciences, social sciences and health sciences. The Graduate School, which is affiliated with Ateneo de Zamboanga University in the Philippines, offers masters’ degrees in business administration, development management, information technology and English. The University of Cambodia has undergraduate degrees in arts and humanities, education, science and technology, as well as a law program, masters’ and doctoral degrees. The AUP offers degrees in business, global affairs, information technology management and law. It also has minor programs in liberal studies and economics. ZamanU has a wide range of degree programs including architectural engineering, civil engineering, business administration, `international relations and banking and finance. Some schools also require applicants to pass an English language test prior acceptance to a college.